Some articles are even rather entertaining. 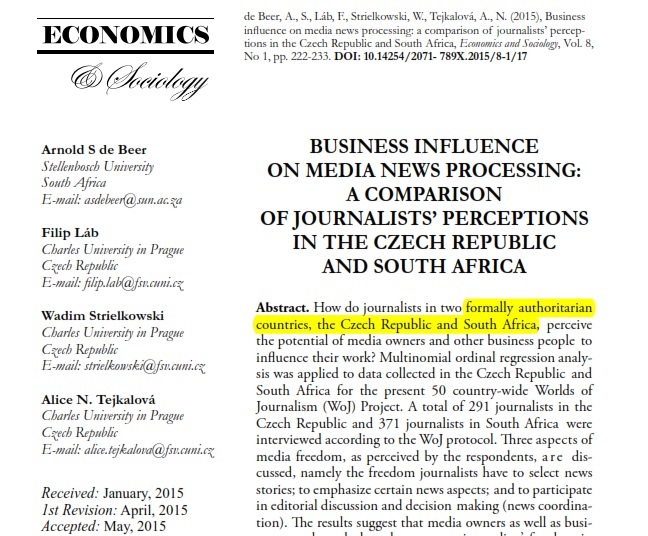 In one of them – published in Economics and Sociology and co-authored by Strielkowski’s other superiors, the vice-dean of the Faculty of Social Sciences and the head of the faculty’s Communication Studies Institute – the authors claim several times that South Africa and the Czech Republic are “formally authoritarian countries”. The fact that no one noticed the authors’ misspelling of the word “formerly” beautifully illustrates the quality of the review and editing processes in such journals, as well as the fact that they have hardly any readership to speak of to notice such a statement in the first place. (The paper remains available online. 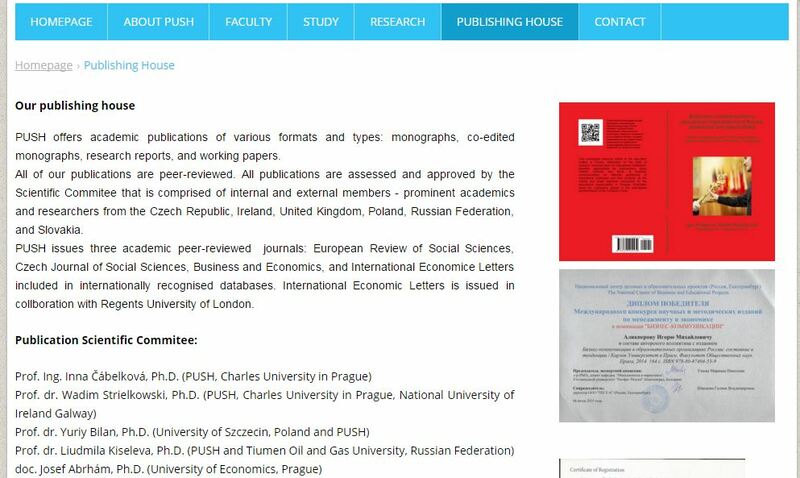 Once the spelling mistake was ridiculed in Czech media, it was corrected – but only in the paper’s abstract.) Editorial handling of another article, published with two of the same co-authors in the Journal of Security and Sustainability Issues, is even more striking, as it was received on 10 November 2015 yet accepted on 20 January 2015! It should be noted that these journals feature in the Web of Science’s Emerging Sources Citation Index and the SCOPUS database, respectively. As more people within Czech academic circles and beyond began to pay attention to Strielkowski’s activities, it transpired that not only did he run a profitable “moonlighting” job, but that he was – and perhaps remains – able to juggle multiple identities. 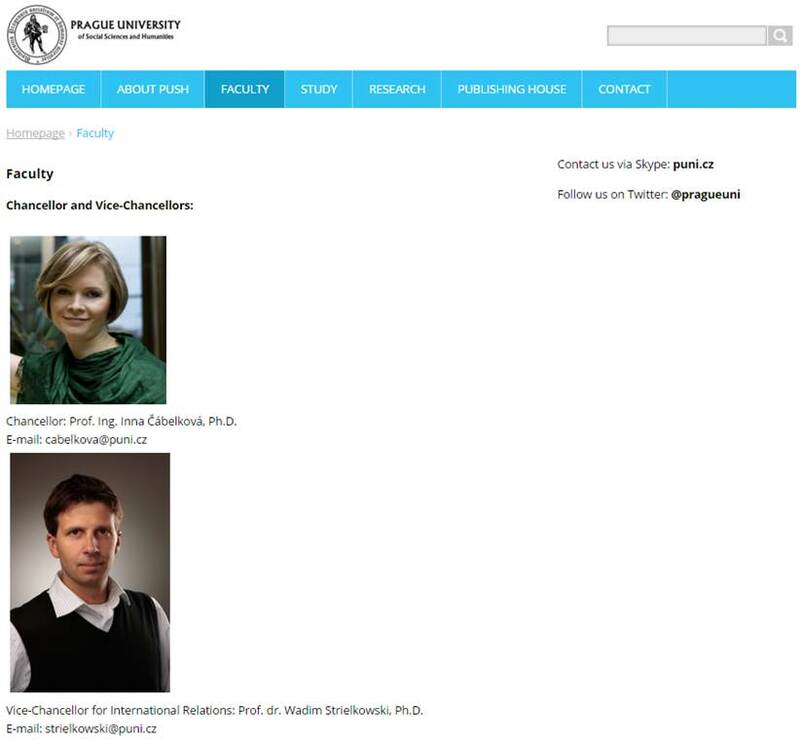 To make his publications look more serious and attractive, some of Strielkowski’s pieces were co-authored by Emily Welkins, allegedly affiliated with the University of Strasbourg and/or the University of Cambridge but in reality a false identity of Strielkowski himself. Interestingly, Strielkowski and Welkins “co-authored” several pieces on vampires, and when the Czech media eventually scrutinised the case he was characterised as a vampire “sucking millions of public money”. Since vampires are simply romanticised parasites, we started to understand that the whole category of predation in academic publishing as coined by Beall would be better described by metaphors of symbioses (between inventive publishers and inventive authors) and parasitism (on taxpayers). Since Strielkowski acted as both prolific author and publisher, we also realised that the symbionts in these scenarios are often so close that it can be almost impossible to distinguish between the two symbiotic creatures – who, in cooperation, leach off societal support for, and trust in, science as a public good. In September 2015, Strielkowski left Charles University. It seemed his only option in prolonging his rich academic career would be to work within the typical habitat of predatory/parasitic publishers and authors, which seems to be mostly Asia, Africa, and Eastern Europe. Indeed, at first that appeared to be the case: that same autumn, Strielkowski undertook a tour of Russia’s provincial universities, where he was welcomed as a famous professor from Charles University in Prague; according to the available information, he sometimes did not shy away from vague promises of institutional collaboration. It is therefore quite remarkable that Strielkowski’s next stopover was Cambridge, more precisely the position of research associate of the Energy Policy Research Group, based at Cambridge Judge Business School. Those familiar with the structure of the University of Cambridge would probably not regard this position as particularly prestigious, but to someone possessed of such an entrepreneurial spirit as Strielkowski, merely being listed on the webpage and corresponding from a University of Cambridge University email address would have been a blessing. No surprise, then, that Strielkowski already features in the editorial board listing of the aforementioned Economics and Sociology as “associate professor, University of Cambridge”. The official page of the North Caucasus Federal University (SKFU) reported on Strielkowski’s visit under the headline “Cambridge – Prague – SKFU. We are developing cooperation”. One wonders what will come next. Strielkowski’s story is an especially bizarre example of what stands behind the sharp rise of so-called predatory publishing. It is estimated, for instance, that between 2010 and 2014, the number of ‘predatory journals’ globally rose from 1800 to 8000, and the number of articles published in such journals increased from 50,000 to 400,000. Importantly, careful reading of Strielkowski’s story shows that his academic-trickster business model worked in synergy with dominant indicators of scientific quality integral to many evaluation and rankings systems. Strielkowski, after all, quite rightly promotes himself as an expert on how to get published in journals listed in SCOPUS and Web of Science – a valued skill, since many national scientific evaluation systems consider these two databases to represent an unquestionable guarantee of scientific quality and even to serve as barriers against mediocre and worthless publications. Considering this case, it seems that the current globally shared obsession with “exact” bibliometric measurements of research productivity and impact is a source from which predatory/parasitic publishing spawns, rather than a remedy for it. We must not forget that the motivation of the two databases, which are owned by private corporations and equity funds, is to make a profit rather than measure quality (which seems a contradictory expression – can quality in any way be measured?). What’s more, the profit-driven character of Web of Science is likely to deepen under the new ownership of Onex and Baring Asia. Finally, by instructing us that the metaphor of “parasitism” is better suited than that of “predation”, the aforementioned tale allows us to refine a more useful conceptual language for general description of the ongoing and rapid metamorphosis of the academic publishing ecosystem. It may well be the case that science is subjected to severe bloodletting – not only by novelistic vampire characters, but also by the established publishers who act as bloodsuckers, this time more amorphous and truly gigantic, who leach off public budgets for science (e.g. libraries’ subscription costs, scientists’ salaries, research expenses) and often the non-paid labour of authors, editors, and reviewers. Even though Jeffrey Beall never really paid attention to “bloodsuckers” and was even accused by many supporters of open access of acting in their interest, his role in pinpointing “vampires” was no doubt pioneering. We believe that the continuation of his work in some form will be critical to and necessary for the credible development of open-access academic publishing, as well as for the cultivation of the publishing landscape as such.